Umtiti on his way to Juventus? 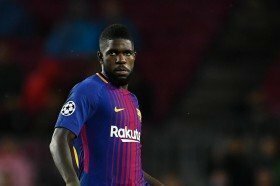 Barcelona centre-back Samuel Umtiti is understood to have made his mind up to join Juventus when the transfer window reopens at the end of the season. The France international has attracted interest from the likes of Arsenal and Manchester United in recent weeks after falling behind the likes of Gerard Pique and Samuel Umtiti in the pecking order for the central defensive role at the Camp Nou. According to Diario AS, a number of clubs have been monitoring the proceedings of the World Cup winner but the Bianconeri are said to have won the race to secure his services. Umtiti has barely started games for the Blaugrana since recovering from a muscular problem earlier in the year and reports have indicated that his exit could be fastened with the club's interest in Ajax's Mathijhs de Ligt. The Netherlands international is currently valued at around &70m and the major part of that sum is likely to be recouped from the sale of Umtiti when the transfer window reopens.